NEA's Everyweek magazine sported lovely covers in the 1930s, featuring impressive work by Ethel Hays, George Clark, Joe King, Dorothy Urfer and others in the NEA stable. Unlike the Hearst magazine covers which led the field, though, NEA did not go in for series. Oh, sometimes they'd do a series of illustrations on a common theme, like One Thousand Years of Love, which offered glimpses of love in different eras. But actual week-to-week stories were pretty much verboten. 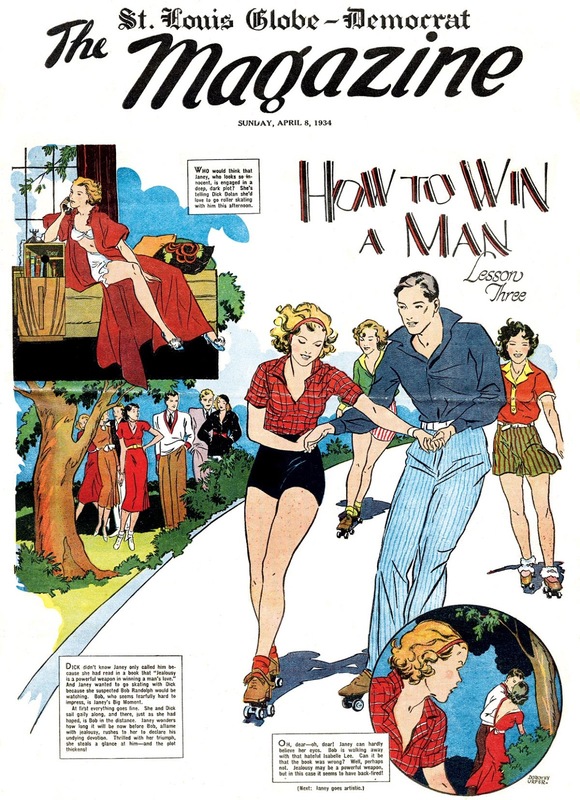 That is, with the exception of How To Win a Man by Dorothy Urfer, a bona fide continuing story series about a girl who tries to hook a beau by following the instructions in a booklet. As best I can tell this is the only one they ever did, and it ran from March 25 to April 29 1934, a mere six episodes.